The Trump administration's plan to weaken federal rules on vehicle emissions could lead to the Supreme Court re-examining a major climate case that defined carbon dioxide as an air pollutant. EPA and the National Highway Traffic Safety Administration are expected to launch a rewrite of the tailpipe rules as soon as this week. It's expected to freeze fuel economy targets at 2020 levels through 2026, allowing automakers to build cars that travel about 30 miles per gallon of gas rather than 36 miles. The administration is also expected to target a legal waiver that lets California set tougher standards to address historical smog problems. EPA might argue that the state's authority over air pollution only extends to local pollutants, not global greenhouse gas emissions. Or the agency could seek to revoke the waiver entirely. That could kill the state's effort to address climate change through a program requiring automakers to sell "zero emission" vehicles. It's likely to ignite a legal battle between EPA and California, plus 12 other states that have adopted standards that exceed federal car rules. That might pave the way to a Supreme Court contest over Massachusetts v. EPA, the 2007 case that led to EPA having its authority to regulate greenhouse gas emissions. If that happens, the administration's decisions now on fuel efficiency could balloon into an expansive fight over the government's role in harnessing gases that warm the planet. It would unfold if an automaker or car dealer sought to intervene in the case once it hit the D.C. Circuit Court of Appeals. A carmaker might argue that EPA lacks authority to regulate greenhouse gases from motor vehicles, said Michael Gerrard, director of Columbia Law School's Sabin Center for Climate Change Law. "They would be making the argument to the D.C. Circuit that the Massachusetts decision was wrong," he said. "That's their effort to reopen the case." Automakers are not unanimously in support of weakening the rules, but some might fight for eliminating them, he said. "I could imagine some in the auto industry wanting to make that argument," Gerrard said. It would all be happening in a high court that has a more conservative complexion. Retiring Justice Anthony Kennedy provided the determining vote in Massachusetts v. EPA, making it a 5-4 decision. At least two conservative justices — Samuel Alito and Clarence Thomas — have called for the case to be overturned. 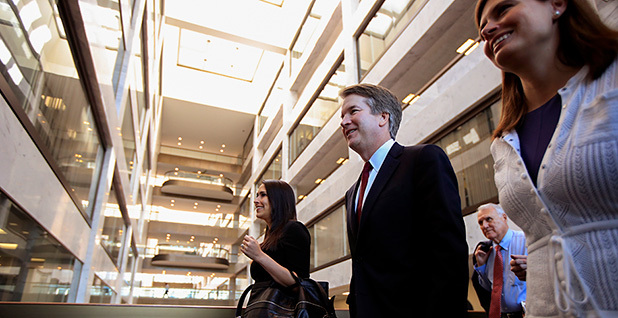 President Trump's Supreme Court nominee, Judge Brett Kavanaugh of the U.S. Court of Appeals for the District of Columbia Circuit, is seen as another potential vote in that direction. Kavanaugh is "in the mold of" the late Justice Antonin Scalia in terms of "taking the separation of powers very seriously," said Andrew Grossman, a partner at BakerHostetler and an adjunct scholar at the libertarian Cato Institute. That means Kavanaugh sees Congress "as the primary mover" in giving EPA and other agencies the authority "to exercise particular powers," Grossman said. Of course, this is all speculative. A series of legal steps would have to occur before the Supreme Court might agree to take another look at the cornerstone climate case. A lawsuit from California and other states would land in the D.C. Circuit. That's when an automaker, a conservative state attorney general or maybe another, unidentified, group with a stake in the case could attempt to get involved. The appeals court would have to consider Massachusetts v. EPA as precedent because it gave EPA the right to set regulations dealing with greenhouse gas pollution, said Sean Hecht, co-executive director of the Emmett Institute on Climate Change and the Environment at UCLA School of Law. If someone didn't like the appeals court's decision, they could appeal it to the Supreme Court. The person or group seeking high court review could ask for another look at Massachusetts v. EPA and whether the federal government should have authority to regulate greenhouse gas emissions, Hecht said. "The Supreme Court could take up that question again because it would be a question that would be raised in that case," he said. It would require an automaker or some other third party to intervene, because the Trump administration probably can't challenge Massachusetts v. EPA if it revises the tailpipe standards, said Dan Farber, a professor of environmental law at the University of California, Berkeley. The government is essentially exercising the authority it was given under the climate case. "If they issue a new standard for vehicles, even if it's a weaker standard, they're sort of taking the authority to issue a standard; that's only possibly because of Massachusetts v. EPA," Farber said. Mary Nichols, chairwoman of the California Air Resources Board, has already threatened to sue EPA if negotiations over the tailpipe rules fail (Climatewire, July 18). "We will reassert our Clean Air Act authority and move forward with our program, possibly with some improvements," she told E&E News last week. "We will do that, and if EPA tries to block us, we'll be in court. Everyone is trying to avoid that, mostly because we don't think it's good for the industry or the consumers." If EPA revokes California's waiver, it could terminate the state's zero-emissions vehicle, or ZEV, program designed to expand the use of clean cars. That could kneecap the state's push to cut greenhouse gas pollution, said Ann Carlson, co-director of UCLA's Emmett Institute on Climate Change and the Environment. "That would be going after California's historic authority to regulate pollutants in addition to greenhouse gas emissions," Carlson said. "If they do that, it's a very aggressive posture." In addition to suing to stop it, California or someone else could file a separate suit arguing that EPA isn't meeting its obligation to protect human health. EPA under President Obama determined that greenhouse gas emissions are dangerous to people. Transportation is the largest source of greenhouse gases, accounting for about 28 percent in the United States. Either one of those lawsuits could push the Massachusetts case back into the high court, she said. Not everyone thinks that will happen. Myron Ebell, a senior fellow at the Competitive Enterprise Institute, said yanking back authority from EPA is a top goal. But it could take more than a California lawsuit and an automaker intervening to get the case reopened, he said. "I hope that's what happens, but on the other hand, my experience is the court tries to find narrow grounds," Ebell said. "If they can rule on the waiver without getting back to Massachusetts v. EPA, they'll want to do that." Hecht said that the high court usually won't reopen a case that was decided so recently. "Even though it was a 5-4 decision, it's very rare for the court to revisit its own clear precedent a decade later." Even though Alito and Thomas said they want to see Massachusetts overturned, Chief Justice John Roberts likely would be hesitant to start reversing precedents, Carlson said. If a lawsuit related to the vehicle standards reaches the high court, the justices could rule in a way that doesn't affect the climate case. It could say EPA has the authority to regulate greenhouse gas emissions in a weaker manner if it desires, Carlson said. The Massachusetts case has been affirmed twice by the court, said Michael Burger, executive director of Columbia Law School's Sabin Center for Climate Change Law. In American Electric Power Co. v. Connecticut in 2011, the court unanimously said that corporations cannot be sued over greenhouse gas emissions because EPA regulates those under the Clean Air Act. That power comes through the Massachusetts case. In Utility Air Regulatory Group v. EPA in 2014, an alliance of power companies challenged Obama-era pollution standards. The high court held that EPA could regulate emissions on large sources, such as industrial and utility plants, but not smaller ones, like apartment buildings. "It would be extraordinary" for the court to overturn Massachusetts "based solely on a change in the composition of the court," Burger said. He also doubts that the auto industry would challenge the precedent. "So you're really left with a related association or third-party think tank making the argument," Burger said. "If the Supreme Court were to take this route, it would call its legitimacy into question in a fundamental way, one which would be difficult to recover from."